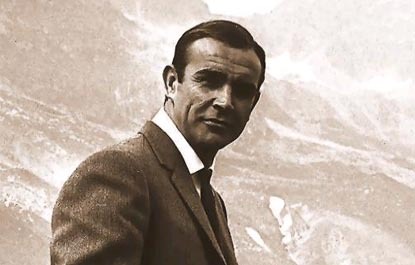 Sean Connery was born to a middle-class Scottish family in the first year of the worldwide Depression. Dissatisfied with his austere surroundings, Connery quit school at 15 to join the navy (he still bears his requisite tattoos, one reading "Scotland Forever" and the other "Mum and Dad"). Holding down several minor jobs, not the least of which was as a coffin polisher, Connery became interested in bodybuilding, which led to several advertising modeling jobs and a bid at Scotland's "Mr. Universe" title. Mildly intrigued by acting, Connery joined the singing-sailor chorus of the London roduction of South Pacific in 1951, which whetted his appetite for stage work. Connery worked for a while in repertory theater, then moved to television, where he scored a success in the BBC's re-staging of the American teledrama Requiem for a Heavyweight. After a succession of jobs, his powerful physique won him a role in the chorus line of the London stage production of South Pacific (1951). Sporadic film work followed, although there were more significant opportunities in television drama, particularly Requiem for a Heavyweight (1956). In 1963 he was cast in Dr No as Ian Fleming's secret agent James Bond, a part he subsequently played on seven occasions. The film's unexpected success established him as an international box-office attraction. Later films include The Man Who Would Be King (1975), Highlander (1986), Indiana Jones and the Last Crusade (1989), The Russia House (1991), Just Cause (1995), Entrapment (1999), and The League of Extraordinary Gentlemen (2004). He won an Oscar as an aging Irish cop with true grit in The Untouchables (1987). In 1998 he received a BAFTA Fellowship award for his lifetime achievements in film.